Unless of course He's working a reverse-psychology scam on us, and actually really wants us to eat baby goats boiled in their mothers' milk. I could point to His convoluted yet successful marketing of the fruit of the tree of knowledge by way of precedent. 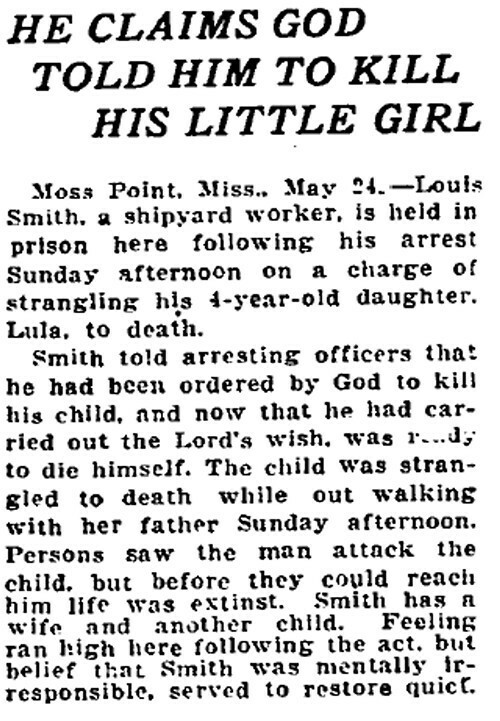 Anyway, He apparently lost His train of thought over something and by the time He was back on the case, Louis Smith's daughter was beside Him up in Heaven. It's not the sort of thing He's prone to apologize for, but He ostensibly felt bad enough about it to spare Louis from a lynch mob, which is what the lovely phrase "feeling ran high here" refers to. It wasn't so easy to derail a lynch mob in 1920 Mississippi. I wouldn't flinch from calling it a miracle.